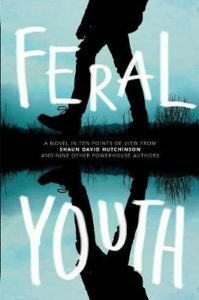 Ten teens are left alone in the wilderness during a three-day survival test in this multi-authored novel edited by award-winning author Shaun David Hutchinson.At Zeppelin Bend, an outdoor-education program designed to teach troubled youth the value of hard work, cooperation, and compassion, ten teens are left alone in the wild. The teens are a diverse group who come all walks of life, and were all sent to Zeppelin Bend as a last chance to get them to turn their lives around. They’ve just spent nearly two weeks hiking, working, learning to survive in the wilderness, and now their instructors have dropped them off eighteen miles from camp with no food, no water, and only their packs, and they’ll have to struggle to overcome their vast differences if they hope to survive. Simon and Schuster Amazon US Book-a-Million! Many of the stories delve into intense darkness, and there are no easy resolutions, even as the focus rests on a group of diverse people learning to trust each other. A compelling examination of the teen psyche. A compelling, uncomfortable narrative that lets readers know that the tragedy the world can bring to teens transcends socio-economics, gender, and race. Edgy stories showcase the depth and breadth of styles in a new crop of writers for young adults.